Since our founding in 2002, BASYS has seen many changes in how merchants process credit card transactions. a P250 printer. These terminals were fantastic. They were reliable, built like a tank, and extremely simple to reprogram. Both card present and card not present merchants used these terminals almost exclusively. Eventually, like most things, they became outdated and were replaced by virtual terminals, e-commerce, high speed internet terminals, tablets, and mobile phones. One of the biggest changes in processing cards was the introduction of Square in 2009. It promised to be a simple method for merchants to accept credit cards. Square did this beautifully by allowing interested sellers to visit Square’s website to submit their information. They were usually approved for an account and mailed a card reader within a few days. 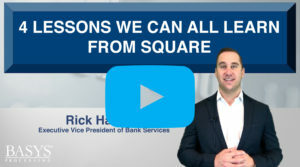 Because they are an aggregator, Square avoided the traditional merchant setup process that all processors must follow. All their sellers are part of one individual Square merchant account, and they created systems to manage the risk and routing of funds to their sellers. Without having to create a MID for each seller, Square was able to instantly create accounts, so their customers could start processing right away. The lesson here is, even though you don’t have the ability to create a merchant account instantly with your processor, you do want to make sure that you minimize the time for account setups. At BASYS, we track how long it takes from signed application to a customer’s first transaction and constantly work to streamline this process. We want to make it as seamless as possible for our partners and merchants. Let’s dig into the numbers on Square’s merchants. Based on 2017 Q3 numbers, Square is processing approximately $69 billion in annual payment volume, generated by 2 million merchants. That’s an average of $2,900 per merchant per month. From just 2012 through 2016, Square has a cumulative net loss of $695 million. Their merchant count has continued to grow, but their profitability has stayed negative year over year. On their last quarterly call, Square emphasized that their new focus is on merchants that process more than $10,000 per month, because they will be more profitable. So, even the micro merchant specialist is shifting their focus to merchants processing over $10,000 per month. Focusing on micro merchants is just not profitable. When Square launched, some people in the industry criticized their 2-tiered pricing model and the fact that a swiped transaction was priced at 2.75%. Merchants didn’t seem to mind and rushed to create new accounts due to the simplicity of it all. Don’t be afraid to put a new merchant on a flat rate or 2-tiered pricing program. There is real value in eliminating complication. Simple pricing models work. Square was early to market with portable card readers and an app-based POS for merchants to accept credit cards using tablets and mobile phones. Having a great mobile processing option for your customers is a must. Merchants want a product that will go beyond accepting a credit card. They want a business solution that can manage inventory, integrate with QuickBooks, allow online ordering and much more.